Indoor farms need light—and a lot of it—to grow crops, but that energy adds up big time in terms of cost and environmental impact. 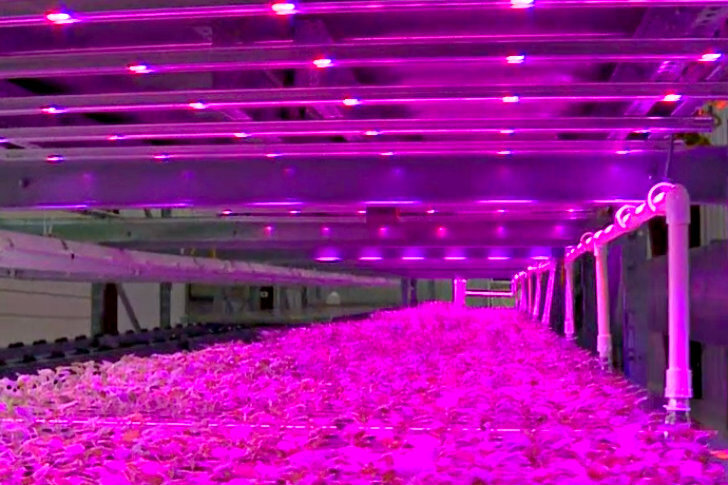 A Pinkhouse is a new type of indoor farm that grows crops using pink-colored light. Rather than bathing plants with white light (which has all the colors of the spectrum), a Pinkhouse uses a mix of red and blue light. 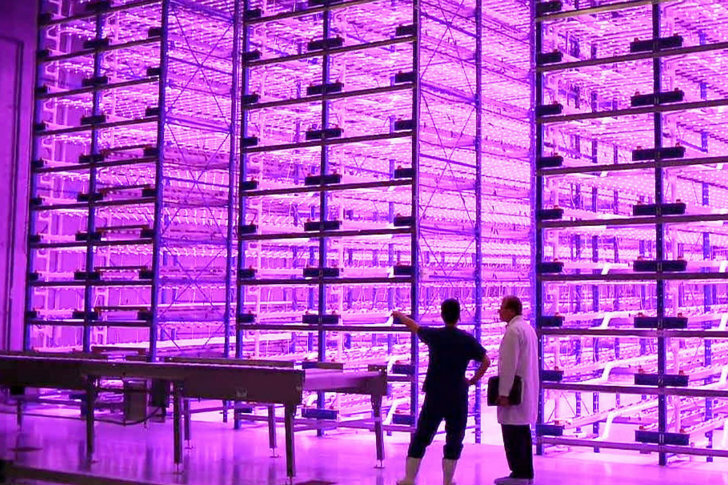 By not using all the other colors, indoor vertical farms can cut down on their power bill with low-energy LED lights that emit just the right shade of magenta. To grow sufficient quantities of food and produce in an indoor farm, crops have to be stacked. But this also means that each shelf has to have its own light source in order for the plants to grow. All these lights add up quick and so does the power bill. A new wave of research shows that “pink” light – a mix of red and blue wavelengths is all that a plant really needs to grow. In the whole spectrum of ROYGBV, the O, Y, G and V aren’t really necessary for plant growth, just the R and B. Besides reducing the amount of power for the lights, the LED lights are cooler, which also reduces the cooling load. This concept has come a long way but when it comes to food there are issues. For example tomato russet mite is a pest that thrives in crops grown under artificial light and requires the use of chemical intervention. Whilst plants don't get nutrients from the sun they do use it to process nutrients. It is not yet sufficiently understood what the excluded parts of the natural spectrum do - it would seem they are essential for the biological control of pests and could impart other benefits. With the infrastructure needs for adding artificial light the systems are restricted in several ways that ideally are avoided. There are ways to bring natural light down into an intensive facility that would allow lower costs and greater plant density. @dgetz - no, plants don't get "nutrients" from the sun, they get energy. Nutrients come from the growth medium, i.e. soil, or in this case presumably some kind of hydroponic growth medium. If you think about it it's really obvious that plants don't use the green parts of the spectrum for photosynthesis - leaves look green because that part of the spectrum is being reflected rather than absorbed. Is it being suggested that I can order a few red and blue LEDs from china for pennies and grow plants indoors off, let's say, a small battery? I don't know a lot on the subject, but don't plants get a lot of their nutrients from the sun ie full spectrum light? Are there any test between the nutrient/vitamin content typical lights and these RB LEDs? I'm curious as to why they aren't called "Purplehouses." Since the Blue and Red alternating LEDS would make up purple. Maybe it's to avoid association with growing Purple Nurple. Wow! It is great to see that this concept is coming to fruition, and hopefully widely used in the future.